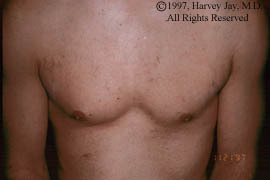 Chest and shoulder of a 36 year old male patient before and after EpiLight treatment. 2 Prior treatments with Softlight (wax, tar, laser) had been unsuccessful. View photos for a different case. View photos for a different skin condition. This set of before & after photos is one of over 100 on this site. You may wish to view before & after results for other skin conditions or explore our comprehensive resources on skin and treatment information. Questions? Comments? Please contact us at 212-755-2237. 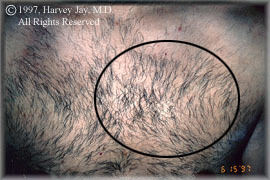 Copyright © 2001-2011 Harvey H. Jay, M.D. All rights reserved. These photographs demonstrate the results of treatments that I personally administered to my patients. For more information and photographs, please visit mdlaserderm.com.